If you’re a first-time buyer who has purchased a dream home, you will have done so with immense delight. The excitement of owning something that is such a big long term investment lasts long in the memory. However, behind those wonderfully constructed dreams, hides the truth of buying any property; making sure you are buying the best one. Homes matter to people just as much as their loved ones, so to purchase the right home, you have to make sure certain legal documents are accounted for. Here’s a guide to making sure the property you buy is legally clear. The Real Estate Regulatory Authority recently passed a bill that effectively puts home buyers in control. You now have the power of the law in your favour, which means that builders have to start giving you what they promised. The RERA Bill ensures that there is more transparency in all the documents and requirements that are shared from seller to buyer. With the RERA Bill enforced, all real estate builders have to be registered under their regional RERA Offices. So now, any property you wish to purchase will be certified as a great one. Make sure you thoroughly understand and know everything that you need to know about the RERA Bill. An NOC refers to a written document that states that a real estate builder does not violate any ethics, codes or laws relating to the real estate industry and market. It is mandatory for a builder to acquire such a document from various legal bodies. For example; when constructing a home, the builder has to acquire approval from the Government that the property is getting decent water supply, via the NOC. As a first time buyer or nth time buyer of a home, you must always make sure to check on home loans available on properties of your liking. Banks that are availing loans to be sanctioned on a particular property indicate that the property is authentic and has abided to all legal documents. Even if you don’t require a loan, always ask a bank about certain properties, as some banks have tie-ups with properties that are guaranteed to sell well and provide you with the much-needed lifestyle amenities. One of the most important legal documents every builder must be having in possession is the Title Deed. The Title Deed verifies that the property is under the seller’s name and is free of any other claims. This is the first of many legal documents that must be obtained to use as the proof for other documents. Buying a property that has a Title Deed gives you a great sigh of relief, as you will be certain that the property is obtainable without a hassle. Builders are required to pay property tax on an annual basis. When doings so, all legal documents must be with the builder. When you decide to buy a home, make sure that the builder is consistent in payments; this will give you a clear indicator that the builder is a reputed one and the properties meet all legal requirements. One of the easiest and quickest ways to check on the builder’s credibility is to check its performance in the real estate market. The market has its set of rules and guidelines that the builder must legally abide by. Word-of-mouth also plays a key role, as highly reputed builders get talked about the most. Choose a home with popular real estate builders Casagrand; the builder has been consistently developing and delivering projects on time, every time! 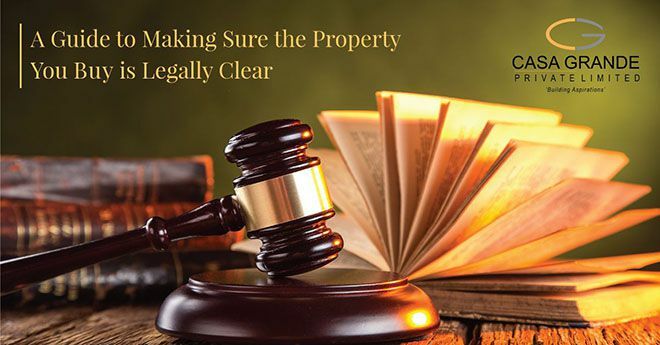 Have you made sure that your property is legally clear? Then learn more about the type of home insurances and why you must invest a home at a young age.